The news was confirmed in documents to the Hong Kong Stock Exchange relating to the £22m sale of the Latics. There is no mention of current chairman David Sharpe, or former Manchester City chief executive Garry Cook, who helped broker the deal. It is understood neither man will form part of the management team and will leave the Championship club. Manager Paul Cook and chief executive Jonathan Jackson will remain in their roles. 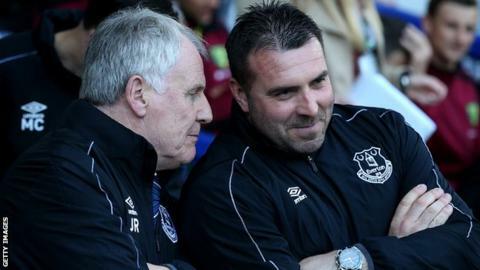 Former England striker Royle, 69, also managed Oldham, Manchester City and Ipswich and was part of Everton's backroom staff until leaving in December 2017. Once the takeover is completed next month, it will bring to an end 23 years of ownership by former chairman Dave Whelan, Sharpe's grandfather. Within a decade, Whelan transformed Wigan from a fourth-tier outfit to a Premier League club. The Latics remained in the top flight until their relegation in 2013, which was confirmed three days after the greatest day in their history, when they beat Manchester City in the FA Cup final. Wigan have since twice been relegated to League One although they returned to the Championship at the first attempt on both occasions.